Ivor Scott from Mylor in Cornwall attended IYRS from 2008 to 2010. During this time he spent a short period working on the early stages of Valdai's restoration, and on his graduation from IYRS he spent 18 months working at Rustler Yachts in Falmouth. 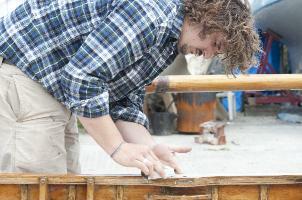 Since then he has been working at Tom's workshop applying his considerable skill in wooden boatbuilding, or he can be found at home in Mylor building a Herreshoff 12' dinghy in his own workshop with Rich. Rich Mitchell originally from Little Missenden and now settled in Penryn, started building boats after time spent training as a jockey, a job working for the British Antarctic Survey, teaching secondary school science and a spell working for Fisheries agency Cefas – an experienced man. He attended the IBTC in Lowestoft and then found his way to Cornwall, thence to Tom's workshop. He also designs and builds his own fine furniture when he is not working on fine yachts and wooden boats with Tom and Ivor.